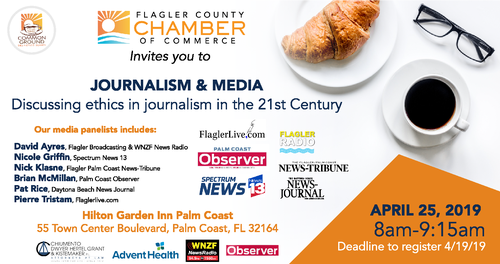 The Flagler Chamber's Common Ground Breakfasts features high-profile subject matter experts on topics that impact local businesses and the community. Special thanks to co-presenting sponsors Chiumento, Dwyer, Hertel, Grant & Kistmaker PL and AdventHealth, as well as media sponsors Marketing 2 Go, WNZF News Radio 94.3 FM and Palm Coast Observer. We can no longer accept walkups. We will gladly provide you with a refund or credit if you cancel your registration by 4/22 at 9:00am, otherwise there is no refund.